El Colacho marks the Catholic Festival of Corpus Christi. 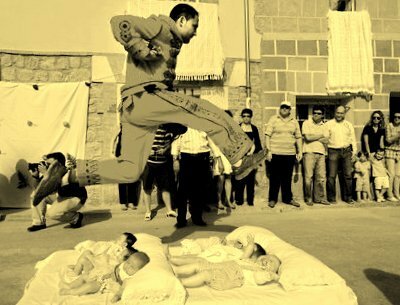 In what can be described as part athletics and part exorcism, grown men in Spain leap over a row of babies placed on the ground. Men don scarier versions of Elvis-like jump suits, whips and truncheons for accessories. 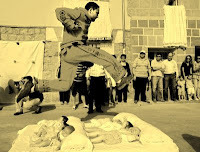 They sprint over the row of babies to cleanse them of evil. Thinking of calling CRY? Don’t. It’s tradition. El Colacho has been in practice since 1620. The event also has a speed exorcism session, where bystanders who seem to be in need of a quick exorcism are pulled into the event. Up Helly-Aa is an annual fire festival held in Shetland to mark the end of Yule season. It is a tribute to the island’s Viking heritage. Up Helly-Aa literally translates "End of the Holy Days". 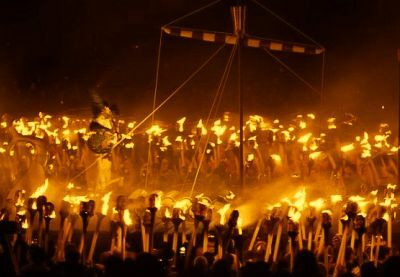 A thousand guizers emerge together on a procession that culminates with the burning on a 32-ft effigy of a Viking Longship. (Remember Dussera? Don’t know about Dussera? Google it). A majority of the men participating in this event dress up in flamboyant feminine costumes causing the Up Helly-Aa to be nicknamed as Transvestite Tuesday. When you can’t beat them, join them, or feed them in this case. Who knows it better than the organisers of the Monkey Buffet Festival in Lopburi, Thailand. During this festival, monkeys are invited to the Pra Prang Sam Yot temple and offered a buffet of fruits, vegetables and nuts. With over 2,000 kg of fruits and vegetables used for the feast, it is surely the highlight of these monkeys’ year. 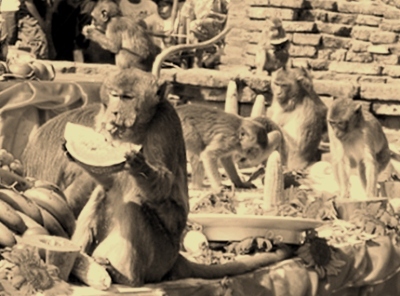 As the buffet winds down monkeys and humans both stroll through the temple grounds, often interacting with each other. The festival marks the event of Lord Rama rewarding his ally Hanuman with the control of what is now known as Lopburi.The Monkey Buffet Festival is held every year on the last Sunday of November. Although Indians hail Hanuman as a superhero and chant Hanuman Chalisa to chase ghosts, it’s an irony that such a grand feast in honour of Hanuman is organized in Thailand. Holi is an Indian National festival popularly observed amongst the Hindu community. It is also celebrated in some parts of Nepal and Guyana. 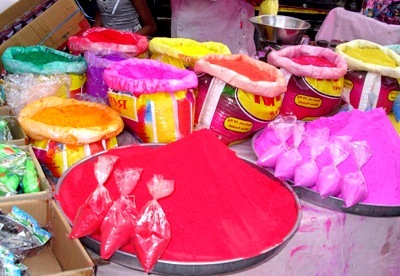 Holi marks the onset of spring after a bland winter. Celebration involves people throwing coloured powder and water. During the onset of spring, due to the change in weather, viral cold and fever spreads among people. It is believed that throwing colours traditionally made of Neem, Kumkum, Haldi, Bilva, and other medicinal herbs prescribed by Ayurvedic doctors helps one to avert such diseases. Who doesn’t like cheese excluding vegans and aspiring anorexics? Think again. Imagine a giant cheese sphere weighing about seven pounds, rolled down a hilltop, and hundreds of people racing against it. It isn’t well-nigh fatal. In plain English “It’s Dangerous”. It’s rare for a participant to bypass the cheese ball, so the winner is decided based on who manages to reach the bottom first, alive. What does the winner get? He gets to take the ball of cheese home. What is done with the cheese later is really not important though. 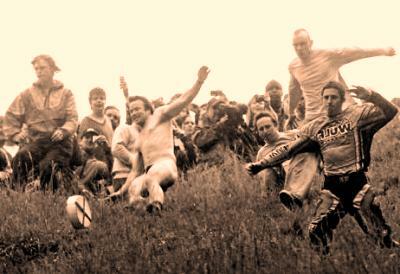 The police attempted to ban Cheese Rolling Festival sometime back, but the dudes who came to participate in the race, probably just gave them the finger and continued with their merry making.